I'm sure you've heard about Mars One in the news. 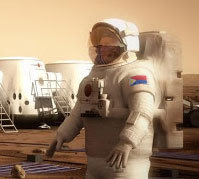 It's the project that aims to colonize planet Mars by sending humans in a one way trip starting on 2023. Well, guess what? Twenty Pinoys and Pinays are up to the challenge. Along with them is a whooping 200,000 people from other countries. That includes almost 50,000 from the US and 30,000 from India. What does this mean? I think Filipinos are happy and contented living simple lives on Earth. I seems that only a few want to live on Mars forever. On the other hand, the sheer number of applicants from US and India seems to indicate that they are not that happy with where they are right now. Or, this might all boil down to the close family ties of Filipinos. How about you? Do you want to live on Mars forever? Sadly, the application for round one has been closed already.